This morning I had a quick discussion with a person who was trying to argue that the complexity of the universe is evidence against the existence of God. He claimed that if a Christian was to argue that the complexity of the universe points to God's existence, then as God is infinitely more complex than the universe (his actual term was "complex to infinity"), it makes it even more probable that God was created. He wrote, "less complex things have a far better chance of being eternal than an almighty god." Such an objection isn't uncommon among atheists. I've seen it frequently myself. As with a lot of retorts, this objection looks sound upon first glance. However, there are at least three rather large mistakes in reasoning in his assertion, they are important for Christians to recognize. The first problem is one I've dealt with quite a bit. 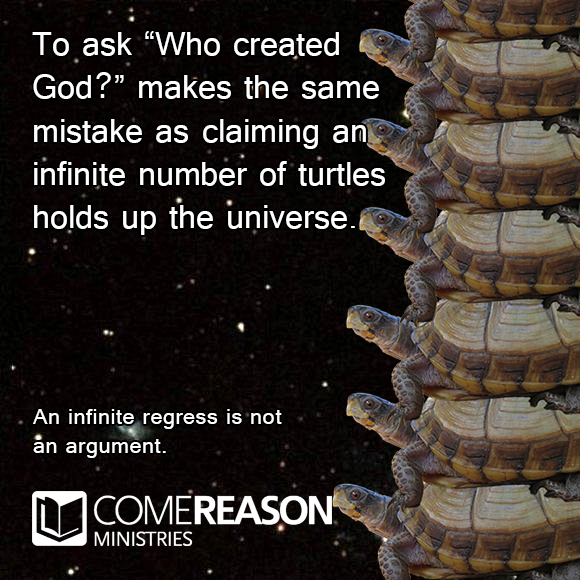 The questioner assumes that if one claims the universe has some kind of cause for its existence, then in order to be consistent, it's fair to ask what was God's cause? But the assumption itself is wrong. Christianity has never taught that whatever exists must have a cause. That would lead to a fallacy condition known as an infinite regress. For example, if one assumes the argument "because the universe exists, it requires a creator which is God," then the next step would be to ask what brought God into existence. Based on the premise, the answer must be some kind of "God-creator." But of course, the following question is "What created the God-creator?" The premise forces one to answer "A God-creator Creator?" The conversation would devolve into an endless series of "but what create THAT?" with no resolution in sight. This is why Christians don't argue "Whatever exists must have a creator." Christianity holds that whatever begins to exist must has some kind of cause for its existence. That's a far more reasonable claim. The second problem in this objection is much like the first. To assume that in order to believe something one must explain all aspects of its existence is to ultimately appeal to an infinite regress. For example, in our discussion above, my interlocutor asked, "How would you know anything is created let alone by a specific entity?" Such a question struck me as odd. Most people have no problem identifying most things that are a product of intelligence versus those that are a product of nature. Archaeologists make their trade on such distinctions. Even when initial appearances are deceptive (like the face on Mars), identifying the hallmarks of intelligence are for the most part intuitive. There are certain times one may question whether a structure was caused by natural processes or an intelligence. In those instances, the proponent of a particular view can offer reasons for his position. But if you must give reasons for your reasons, and then reasons for those reasons, you are again caught in an infinite regress. Something like a watch is clearly the product of an intelligent mind. One doesn't need to supply reasons for that conclusion; it's obvious to all but the most obstinate skeptic. When I responded my interlocutor, I simply asked him if he can tell that a watch found in the dirt is designed. He didn't seem happy to answer this question. Tomorrow I will take up the last problem in the argument that a complex creation like the universe requires an even more complex God to be created. For now, realize that not every explanation needs an explanation of its own. To believe so is a mistake in thinking.